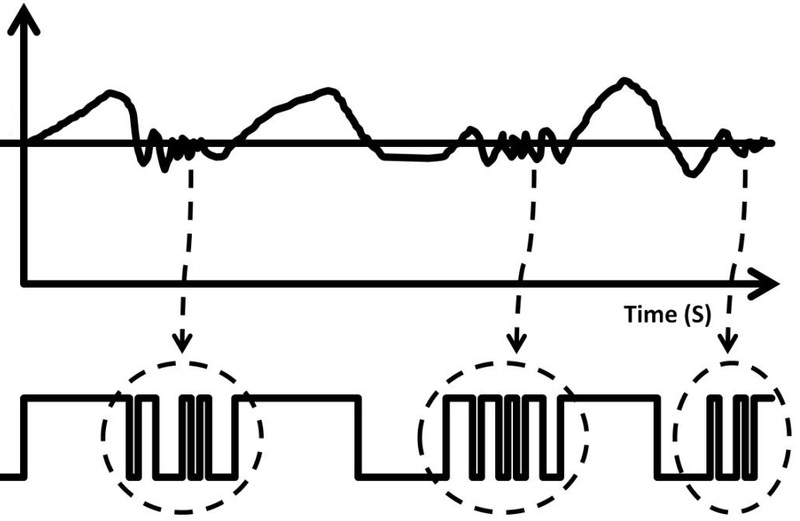 Noise in the real-world systems can cause fluctuations in signal levels, hence the need of implementing hysteresis. The figure below shows a possible scenario that the changes in input levels causing the false trigger of the comparator outputs. Hysteresis is simply a positive feedback technique used in for example, op-amp configurations to provide to pre-determined comparator thresholds. Hysteresis can also be called Schmitt Trigger. 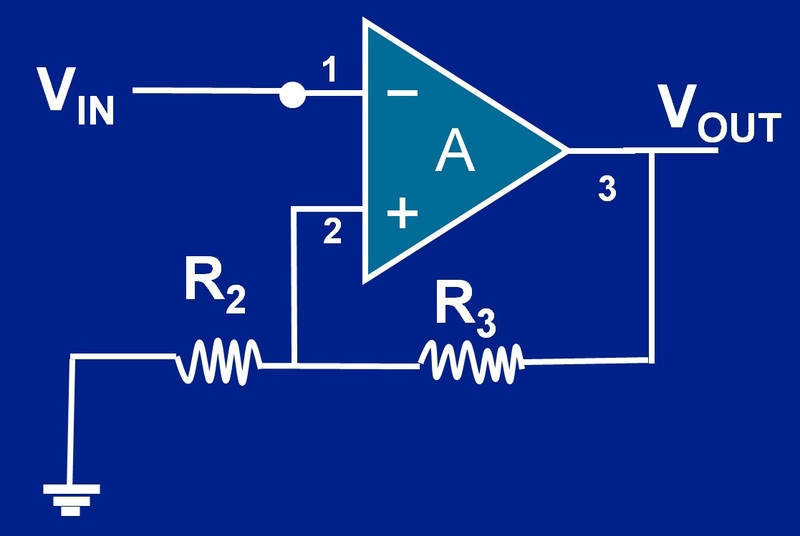 The figure below shows an op-amp hysteresis circuit. This op-amp is an inverting comparator with Vin connecting to the V– (inverting input) while the positive terminal (V+) connects to the midpoint of the voltage divider (R2 and R3) forming a positive feedback network. V+ is now the upper and lower thresholds of the comparator set by the R2, and R3. Assuming VDD and VSS of the op-amp are +5V, and -5V, and R2 = R3. 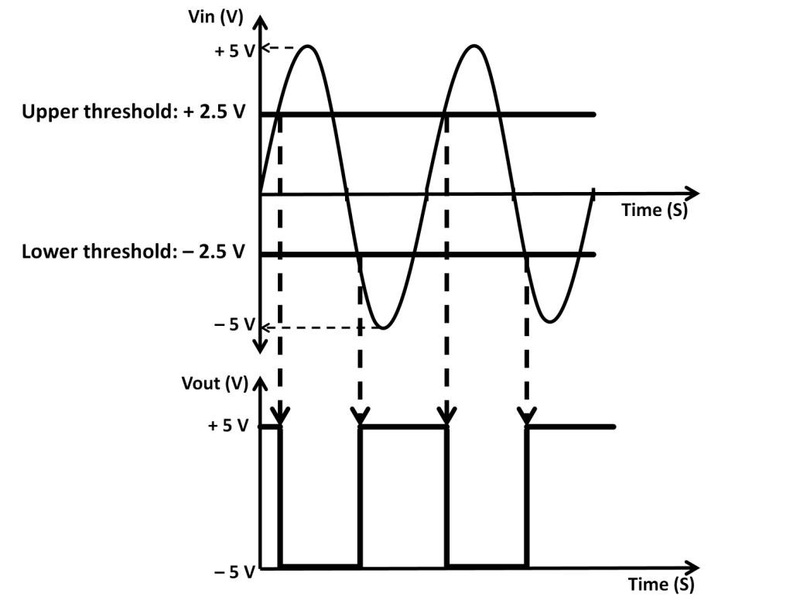 When Vin starts to rise from 0V, Vout goes to the positive rail 5V due to its high gain. The upper threshold is now at 2.5 V set by the voltage divider. While Vin continues to rise from 0V (before 2.5 V), Vout stays at 5 V due to the high gain of the comparator. Once Vin rises slightly above 2.5 V, Vout flips to the – 5 V rail (V– > V+). The comparator’s threshold V+ now is set at – 2.5 V, again by the voltage divider. Vin continues to increase above 2.5 V while Vout remains at – 5 V (V– > V+). As Vin (V–) starts to fall from its peak just below 2.5 V, it continues to stay low -5V. V– remains less than V+. Once Vin (V–) falls below – 2.5 V (V– < V+), Vout flips to the positive rail, +5V. The same mechanism repeats to the next cycle. We now successfully set a hysteresis zone between +2.5 V and -2.5V. To change the zone threshold values, you can simply adjust the size of R2, and R3.